Q: I hear about people using glass aquariums, but I keep reading how they will stress my chameleon by showing reflections and cause respiratory infections by the low ventilation. How does your Clearside material work? A: The material used by Dragon Strand to create the Clearside cage line is a clear, flexible PVC. As with glass or acrylic, the main concerns are reflections and respiratory infections. So let’s tackle reflections first. When our clear materials are hit by light at a certain angle, we will get a reflection. Chameleons will react to these reflections in different ways. Many chameleons are not bothered by whatever reflections may occur. There are multi-generational breeders that have used glass and do not report experiencing problems with reflections. In my personal tests I had trouble getting my chameleons to take the reflections seriously enough to react. Then I’ll hear from someone who is insisting their chameleon is reacting to reflections and further I’ll have breeders who had a reflection experience and refuse to use glass ever again. It is difficult to nail down what the problem is and when reflections become a problem. With so many people using glass or the Clearside material without an issue there is a much more complicated answer than reflections = stress. I do not have an answer to that dilemma just yet (I continue to seek an answer to this contradiction). But what I can say is that there are reasons you get any cage material (ventilation, insulations, size available, etc…). If that cage composition, or any aspect of the cage, is giving us a benefit and is causing us an issue we do not swear off the material. We solve the issue and retain the benefit! In this case, if you are getting a reflection and your chameleon does see it as a threat there are two approaches. 1) see if your chameleon gets used to the intruder that never comes into his cage. 2) Change the light position or switch up the internal decorations and plant life to block the offending area. Respiratory infections occur when the immune system is compromised by any substandard husbandry. The early experimenters would get RIs because of putting too much water and too much heat into the cage (Jackson’s chameleons are incredibly exotic so that means hot and humid, right?). By drastically reducing the misting and limiting the time the heat lamp was on there would have been much more success. The Dragon Strand Clearside cages have ample ventilation so it would actually be difficult to create a condition where there would be standing or stagnant air. Having one whole side and the top screen means you will have to put in effort to create a humidity pocket and you will have to use live plants as they will continually produce humidity (during the day, at least). You will need this to maintain humidity with the ventilation of the clear side cage line. The front of this cage is clear while the side is screen. This picture shows the difference in visibility. Having one side screen and the other side solid clear a humidity gradient may be realized. Glass cages, like screen cages, have their advantages and disadvantages. When evaluating anything I prefer to address characteristics instead of making a judgement. Glass, Acrylic, and the clear flexible PVC used in the Dragon Strand Clearside cages have the characteristics that they limit air flow and they are clear. The limitation of airflow means that heat and humidity is trapped inside. If your home is 90F and 80% relative humidity a glass cage is a death trap without some serious attention to the energy and water input into the system. If your home is 68F and 10% relative humidity, a glass cage can be a lifesaver. 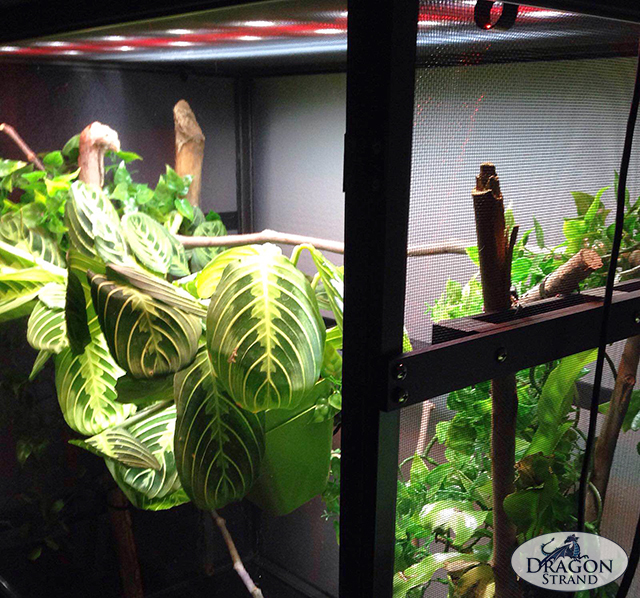 With the Dragon Strand Clearside cages I am looking to create a middle ground that provides more ventilation than a glass cage, but allows the keeper to more easily create a humidity pocket within the cage in a way not possible with a screen cage. Once again, it is all a balance. I created the Breeder series and Clearside series, in part, because I wanted both ventilation and an area that would retain humidity. This is why my Clearside cages have one full side screen. Especially on the Large Clearside Atrium, I was wanting to create a cage that allowed one end to be humid and one end to have ventilation. 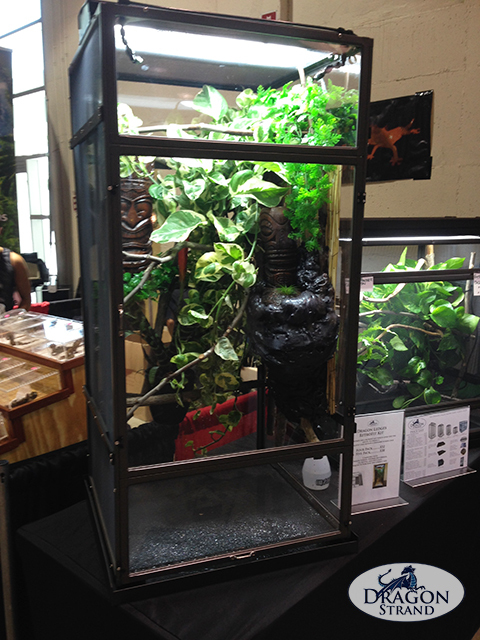 This replicated the “forest edge” that many of our chameleons live in. Working with the Dragon Strand Clearside cages is just like using any cage. Know what environment you are trying to create (this depends on species) and get the cage that will help you maintain those conditions in the environment you are in. The Clearside cages are specifically designed for keeping chameleons in standard homes that are kept at the human environmental comfort level. 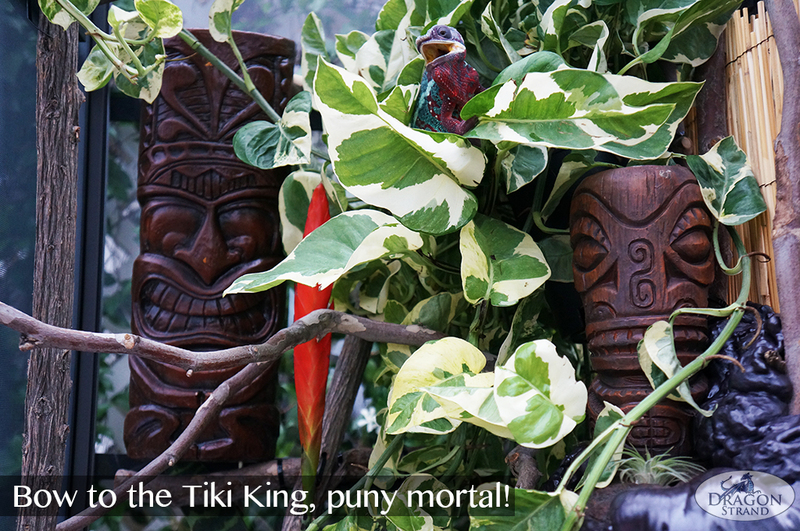 Any heating up in the morning can be done with a basking lamp by the screen side and humidity can be increased by creating a dense collection of plants on the opposite clear side.